We are all saddened by the recent tragic terrorist attacks in Paris. I wanted to feature a French dish, a hug, if you will, for the people of France. I was fortunate to have lived for some time in France. Not only is it a beautiful country but the food is wonderful and never disappoints. I can honestly say I never had a bad meal in France, whether in Paris or small towns. There will always be a warm spot in my heart for France. 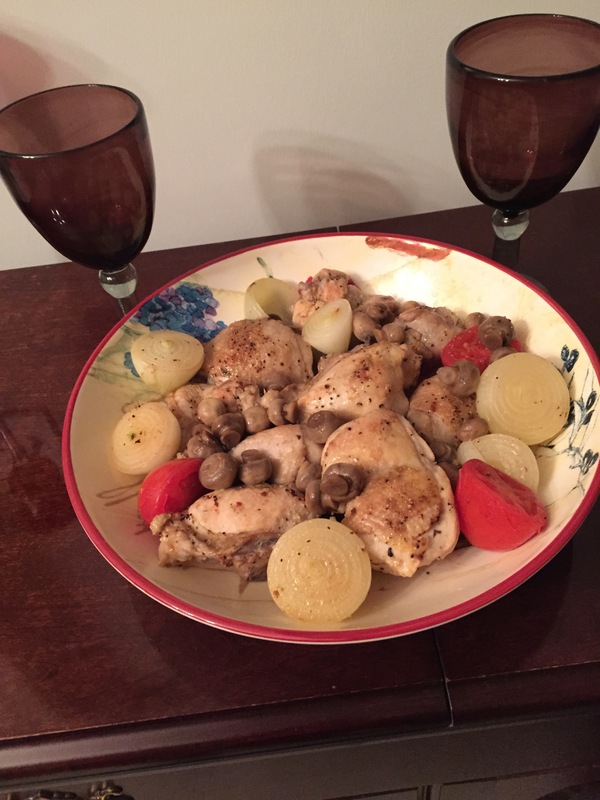 I picked Chicken Marengo because there is some history attached to the recipe. This version is also very easy. It is adapted from a cookbook that is now out of print: European Cooking, Traditional Recipes from 24 Countries copyright 1958. Supposedly, Chicken Marengo was created by Napoleon’s Chef Dunand who had very limited supplies to work with after one of Napoleon’s important battles. Napoleon wanted a festive dinner to celebrate his victory at Marengo, Italy June 14, 1800 against the Austrians. Chef Dunand had to go foraging in the town to find ingredients for a festive dinner. There are a lot of different stories about this recipe but it is thought that the original version may have included crayfish and toast topped with a fried egg. Today most versions of the recipe skip the crayfish, toast and egg. I found a version of this recipe that appeared in an 1882 cookbook: The 366 Bills of Fare by Baron Brisse, in French and English, translated by Edith Matthew Clark. If you are interested in reading Baron Brisse’s unique and interesting cookbook, a free EBook is available for download by Google Books. I thought the recipe would be in Mastering the Art of French Cooking by Julia Child but couldn’t find it in Volume one (the only volume I have). Further research found that Amazon Prime has several seasons of Julia Child’s cooking shows available for view. To my delight, one of the episodes is Chicken Napoleon (Poulet Sauté Marengo), Season 6, episode 19. She is funny because after she talks a little about the history of the recipe, she pulls out a huge sword and starts chopping up the chicken for the recipe. In this episode she includes shrimp, French fried eggs and large triangle croutons, following closely to what the original recipe may have included. She notes that crayfish were not available in her area. It is interesting that she includes brandy in her recipe and flamed the chicken. But I’m sure Napoleon never traveled without his French brandy. Season the chicken with salt and pepper. Heat olive oil in a large Dutch oven or frying pan. Brown the chicken in the olive oil on all sides until golden brown. Remove the browned chicken from the pan. Add the onions, mushrooms and garlic. Sauté for 3-4 minutes. Add the quartered tomatoes and sauté for an additional minute. Return the chicken to pan with the vegetables. Pour the wine over the chicken and vegetables. Add enough wine to the half-way point of the chicken. Cover and simmer about 45 minutes or until chicken is done. Serve in the wine sauce.